We couldn’t resist this brown cupboard with its acres of storage space and handy stash busting shelves. Not pretty and not about to go anywhere when we spotted it in the charity shop, we knew it was a perfect canvas the big bright jungle leaf treatment. Use a mild solution of washing up liquid and warm water to wash down the cupboard, make sure you remove all grease marks. Leave to dry, then rub down with fine grade sandpaper. Paint primer, you may need to add a second coat to cover the brown stain. Paint the exterior and interior with matt emulsion paint. 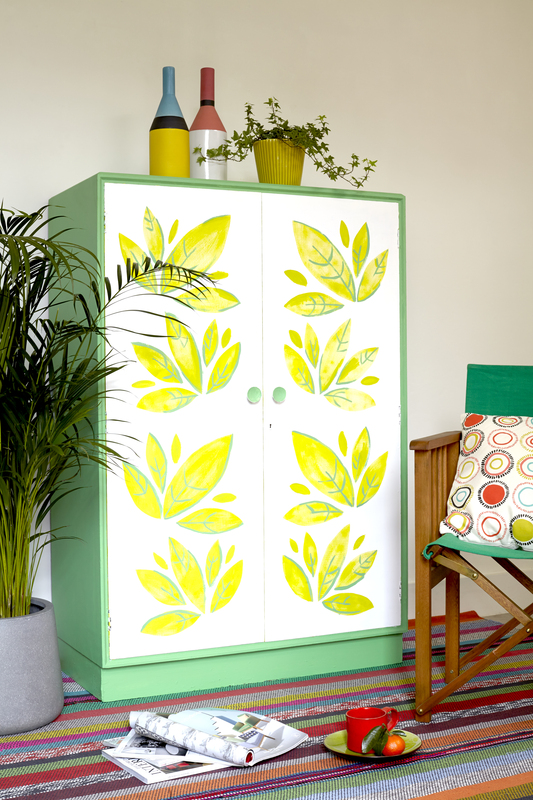 For a really long lasting paint finish strip the cupboard with paint stripper before painting.